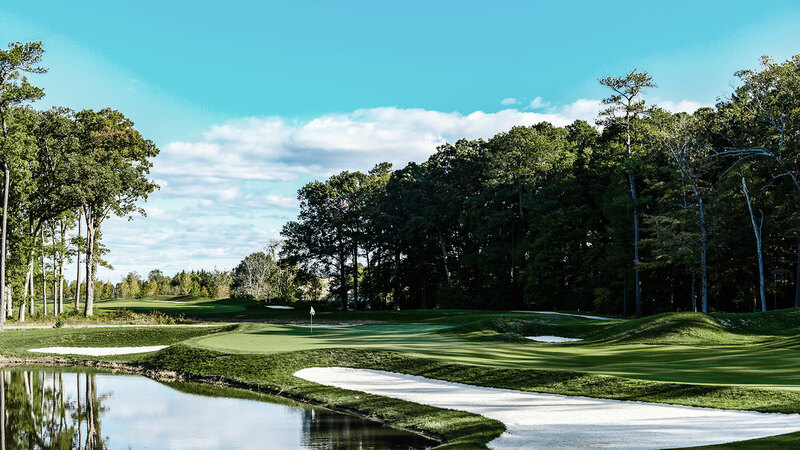 Voyage inland through lush woodlands and man-made dunes sculpted from the earth before feeling the breeze off the water as the course transforms over the final stretch of holes. 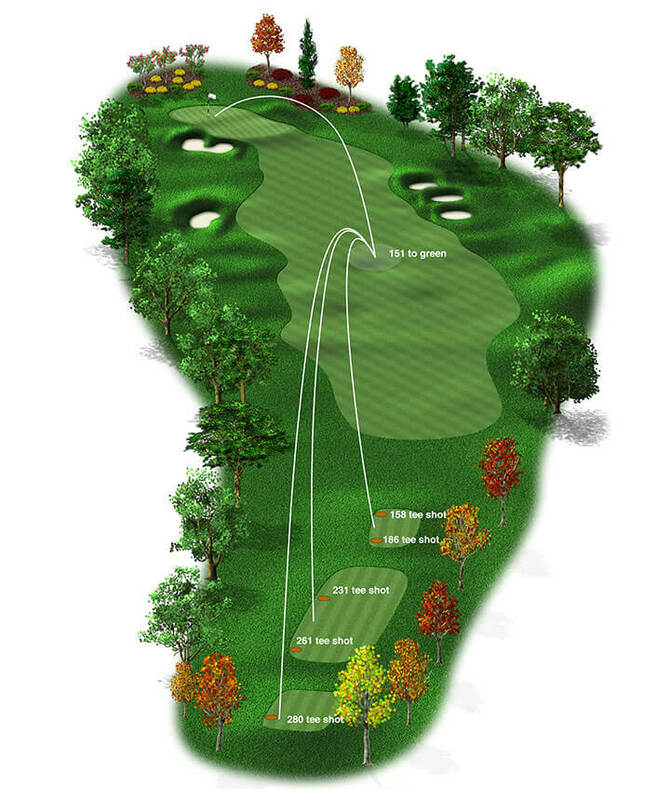 The starting hole should give the golfer a feel for the course without being too demanding. A generous landing area allows room for error on the first swing of the day. Aim at the large bunker on the right side to be safe. 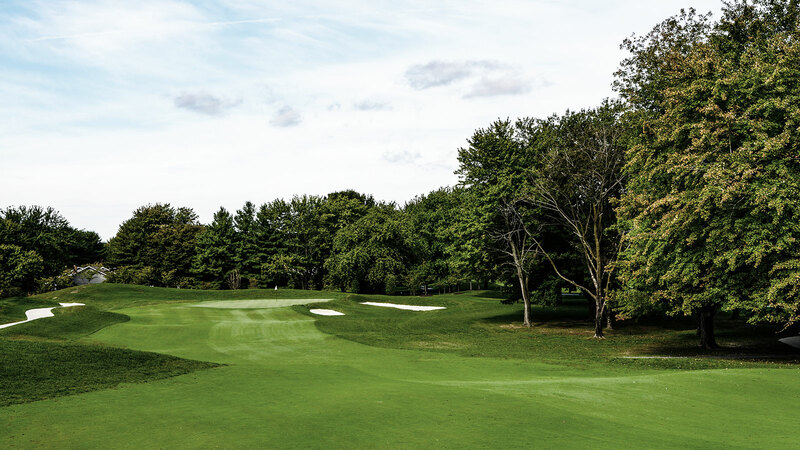 If you want to be aggressive hug the left side of the fairway, a bad bounce could end up in the rough or on a side hill lie and present a difficult next shot. 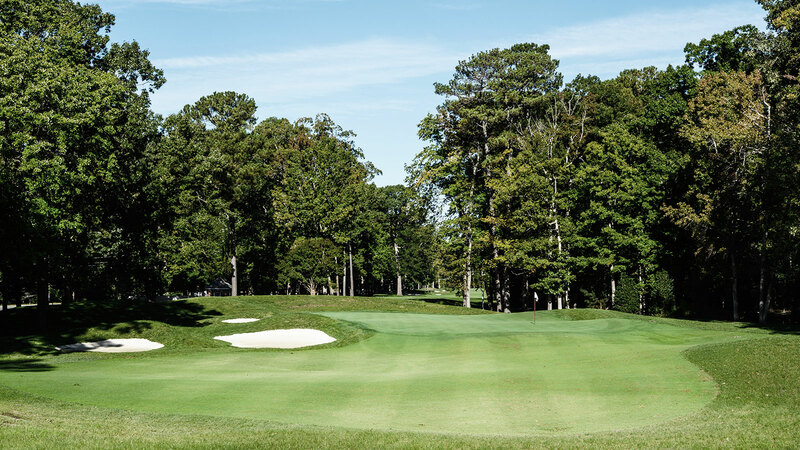 The second shot is into a small, relatively flat green guarded by a horse shoe of mounds with Pete Dye-style bunkers on both sides. 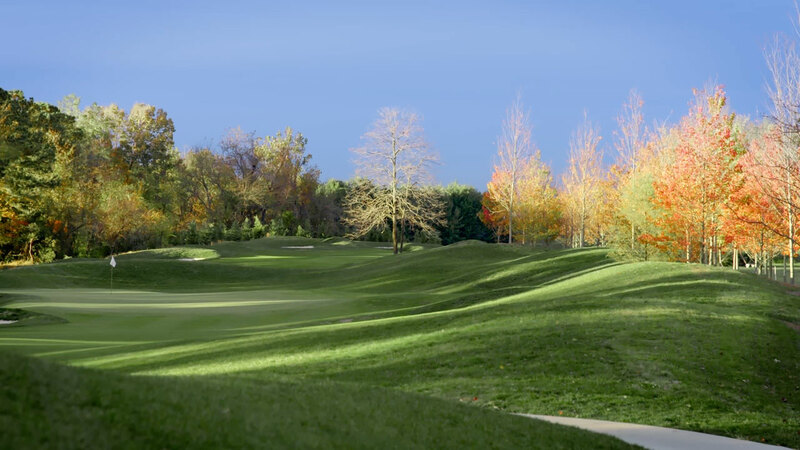 Before reaching the difficult holes, enjoy this picturesque spot featuring a generous landing area. One of the easiest driving holes on the course. 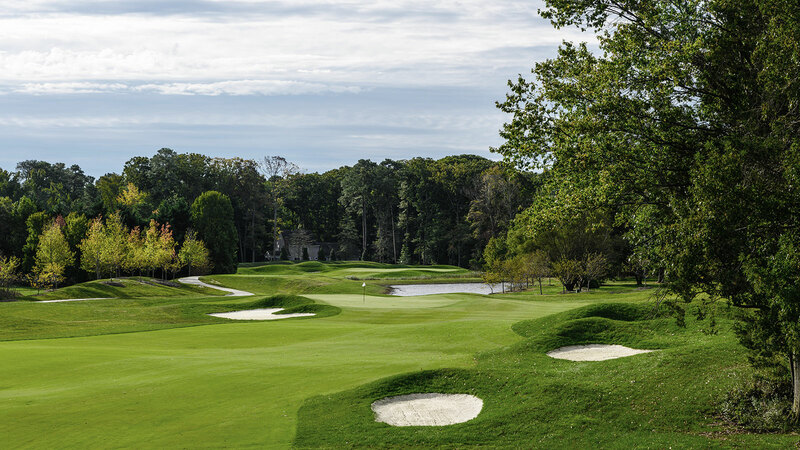 Keep the ball in the fairway and you won’t even notice the three pot bunkers to the right approaching the green. 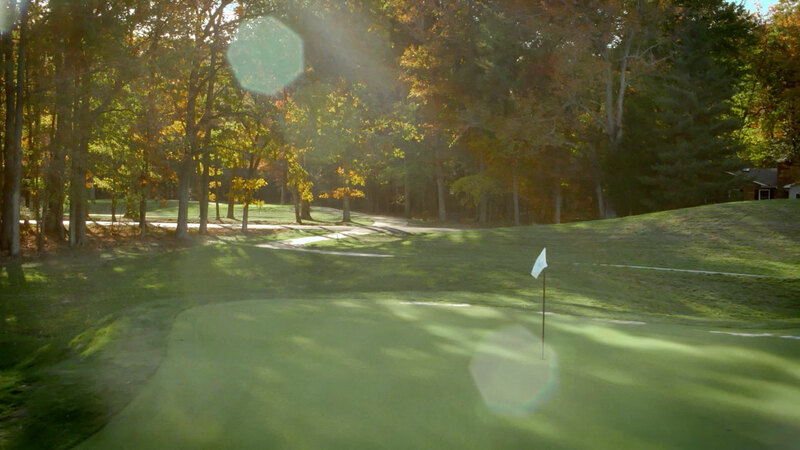 The second shot is relatively at and you have a clear view to the hole. 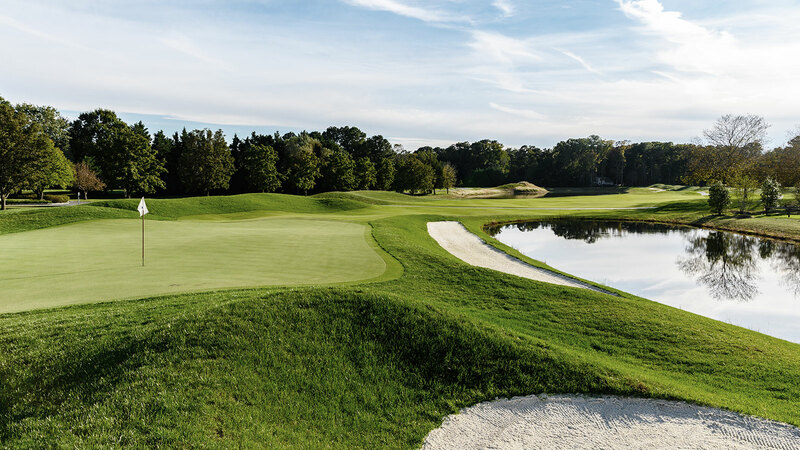 The green runs right to left and is guarded by a greenside bunker. 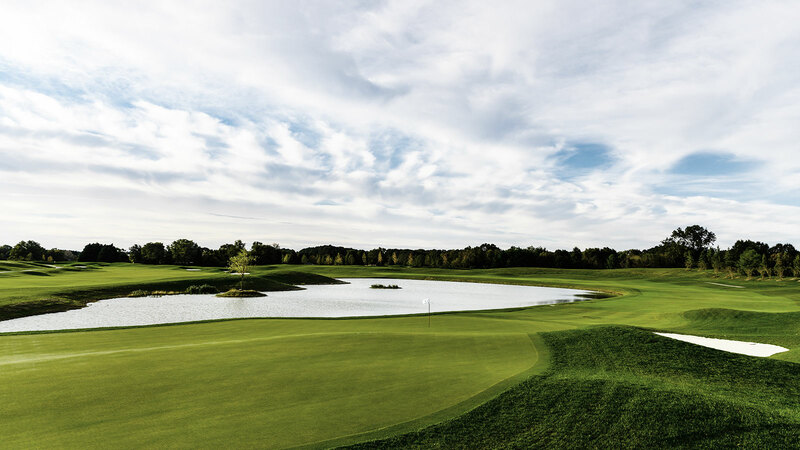 Golfers will need to carry the pond from the 205-yard tips tees; the water is less in play from the remaining tees, yet still guards the entire right side of this hole, making correct club selection essential. There is a little room short and left for the timid golfer, but accuracy is important. 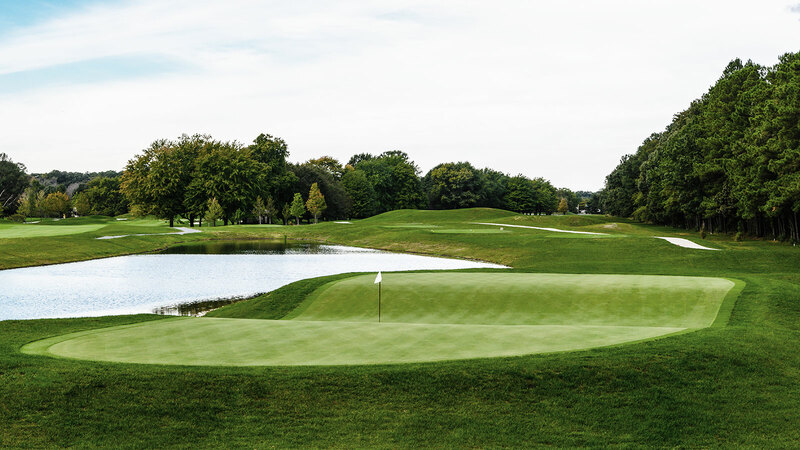 The green is long and it is mandatory to stay below the cup when putting. 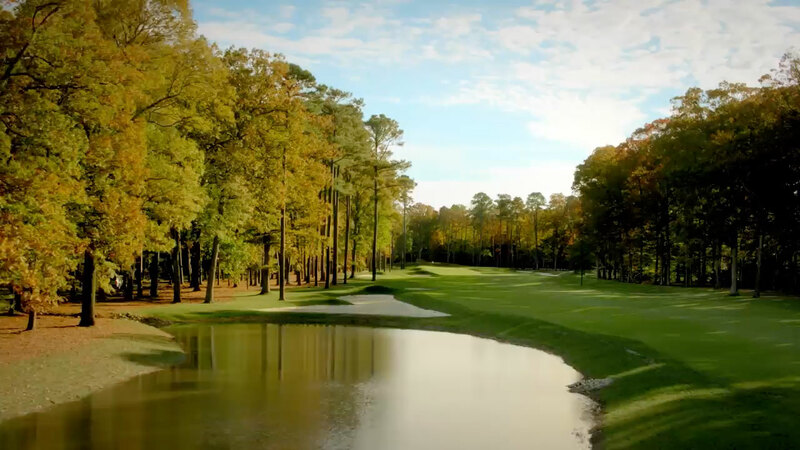 With water coming into play on this demanding tee shot, focus is important. 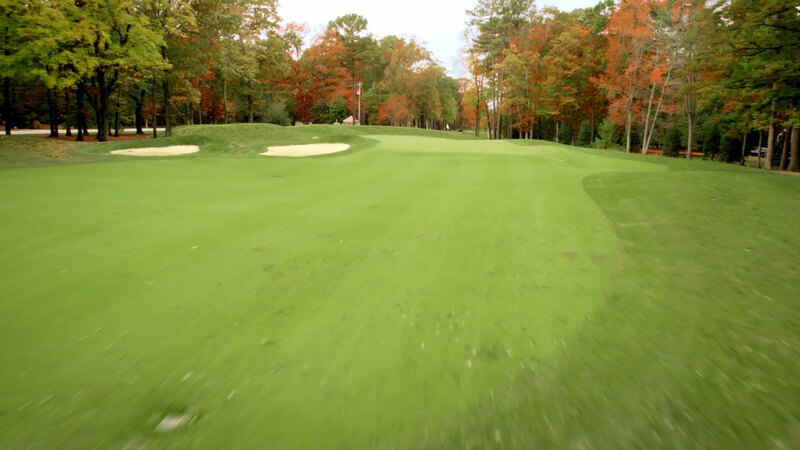 Split the fairway and you are halfway there. 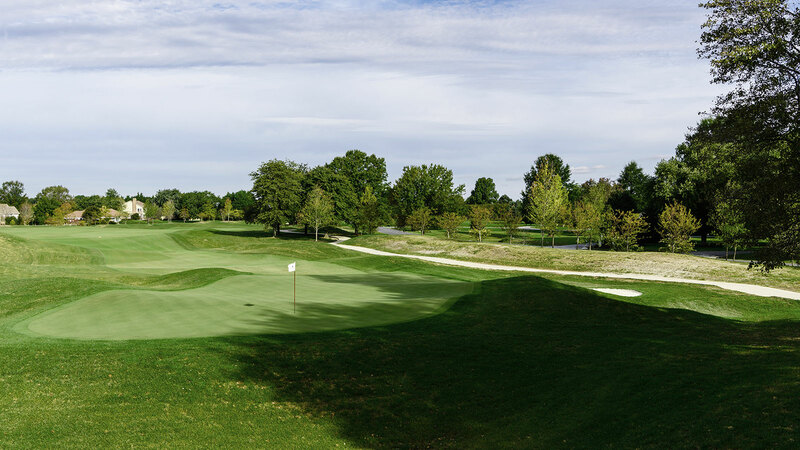 On your second shot beware of a small greenside pond on the left and two deep bunkers right. 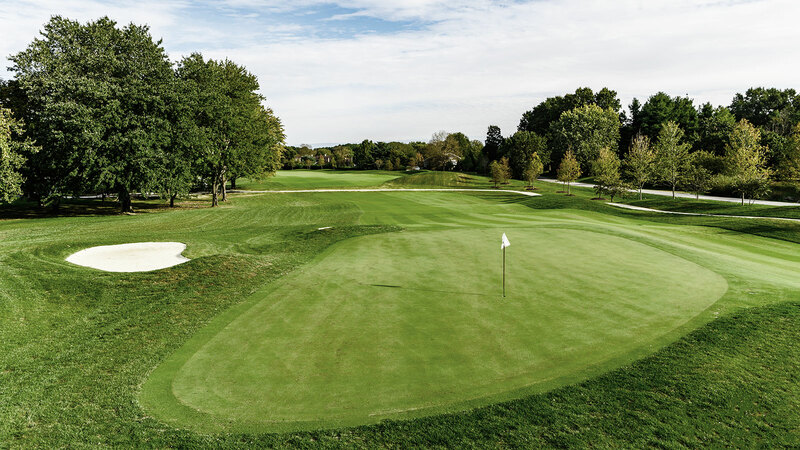 The green position is slightly uphill with an undulating putting surface. 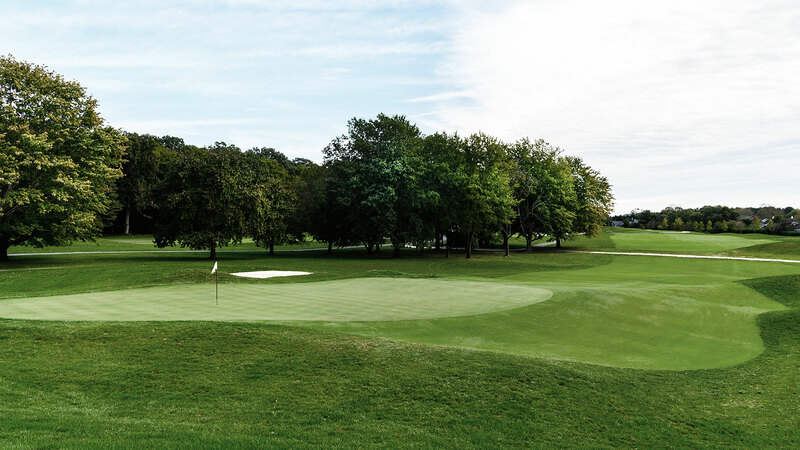 You will need your best on all three shots to reach this well-guarded green in regulation. 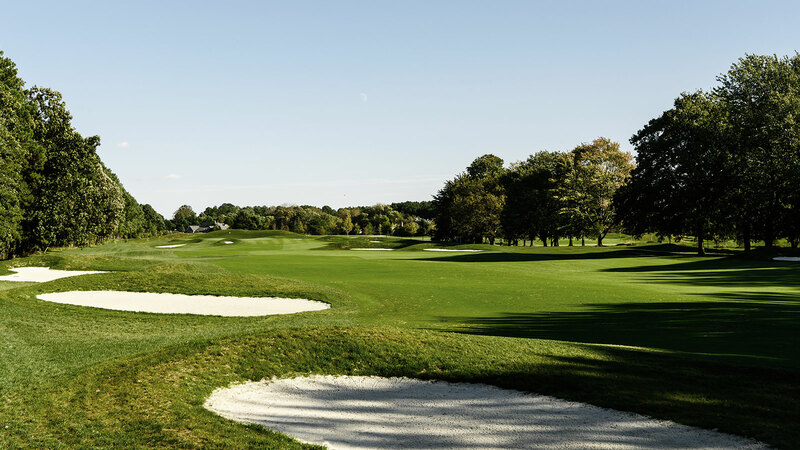 The fairway is wide, aim at the center of the three bunkers towards the right side. 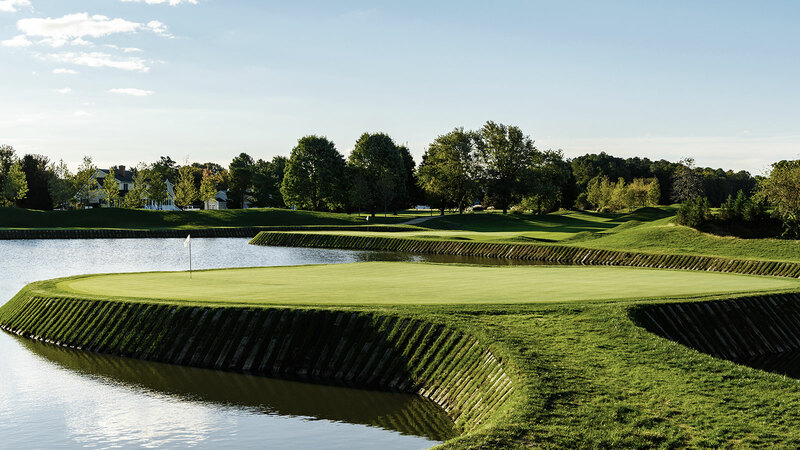 The key to this hole is to stay in the fairway at all times. 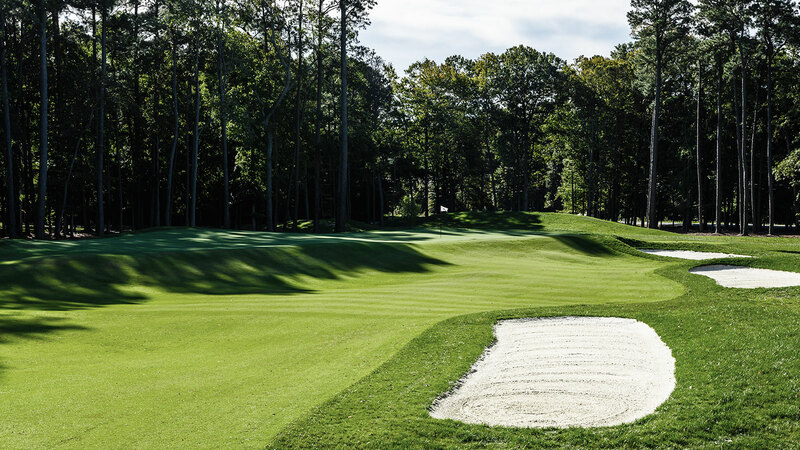 With 12 bunkers on this hole, you will do well to keep your feet out of the sand. 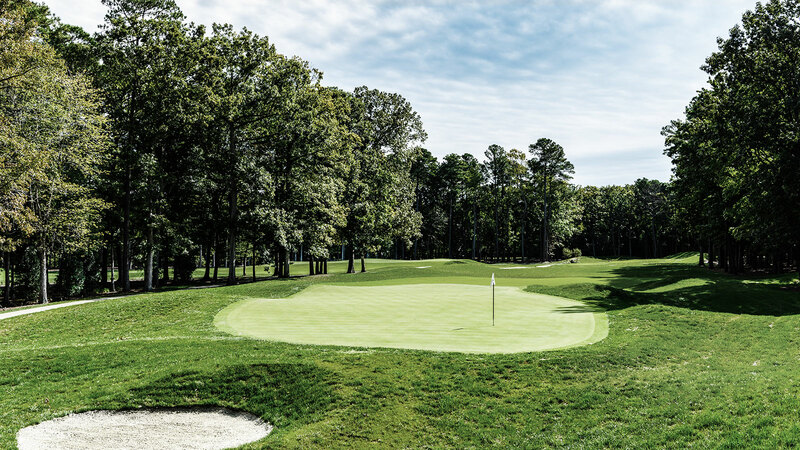 The green is elevated which may require an extra half club, but once on there are only subtle breaks to a affect your putt. 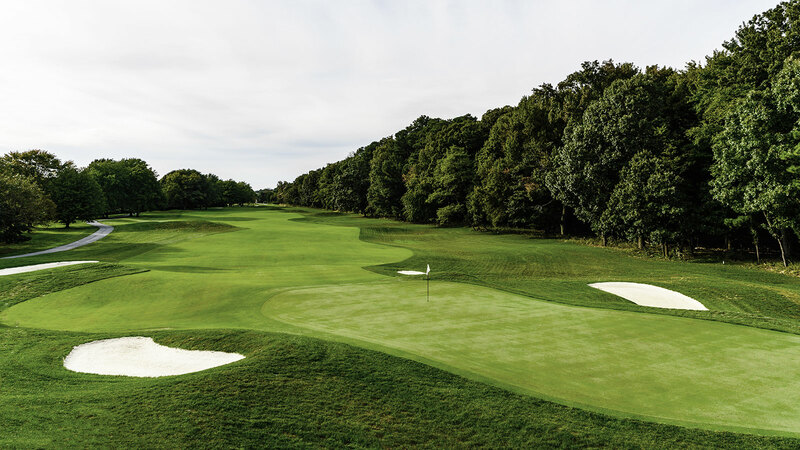 This hole boasts a green reminiscent of the 9th at Yale Golf Club. 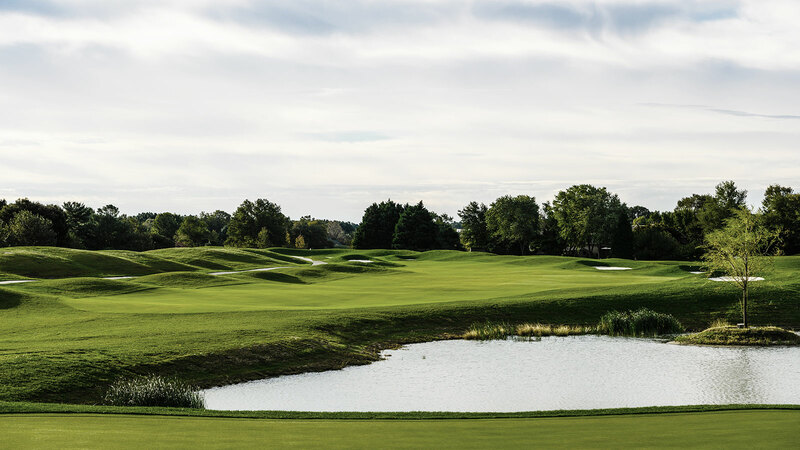 The forward tees keep the water to the right, but is still intimidating. As you move back the water becomes more apparent. 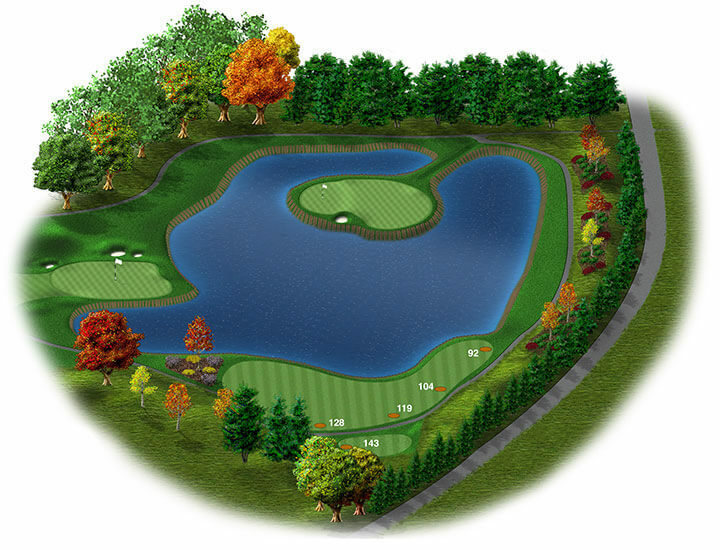 The back tees will require a tricky 245 yard shot over the entire length of the pond. 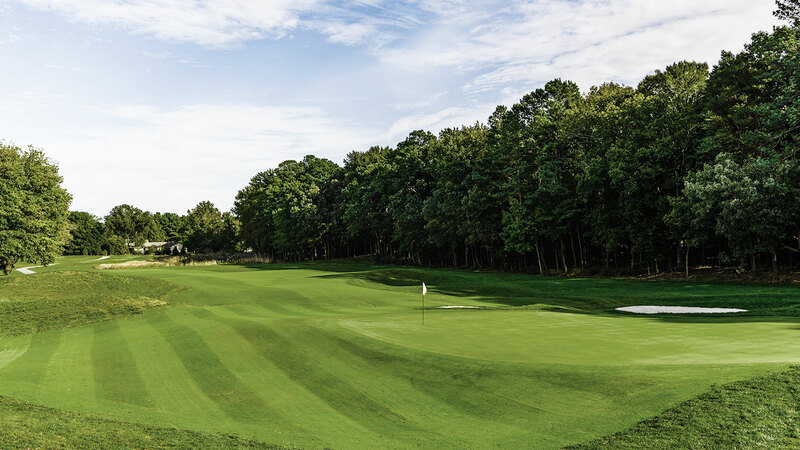 Simply hitting this green is no guarantee to make par. 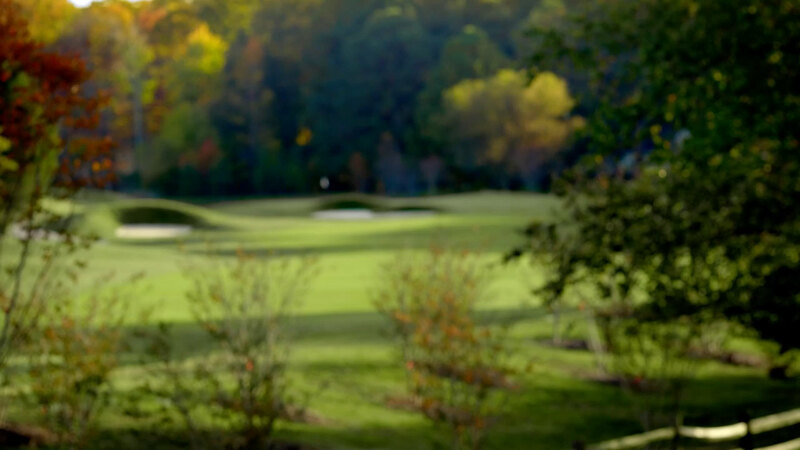 The green covers approximately 9,500 square feet and is 75 yards long by 25 yards wide. 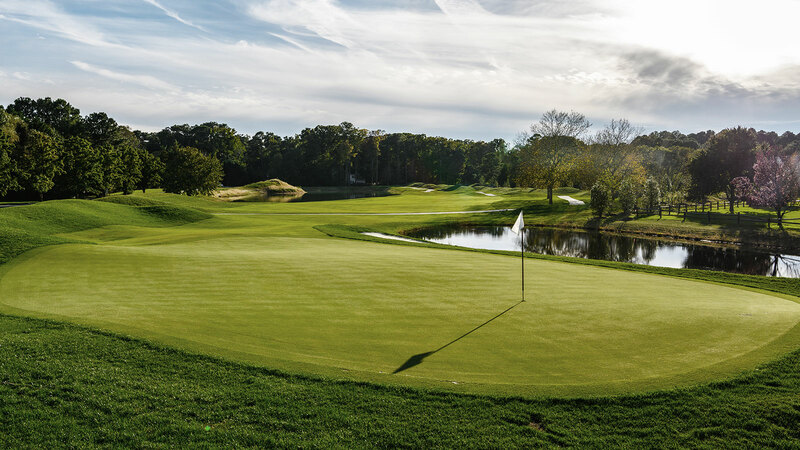 The best feature to the green is a seven foot dip in the center of the putting surface. 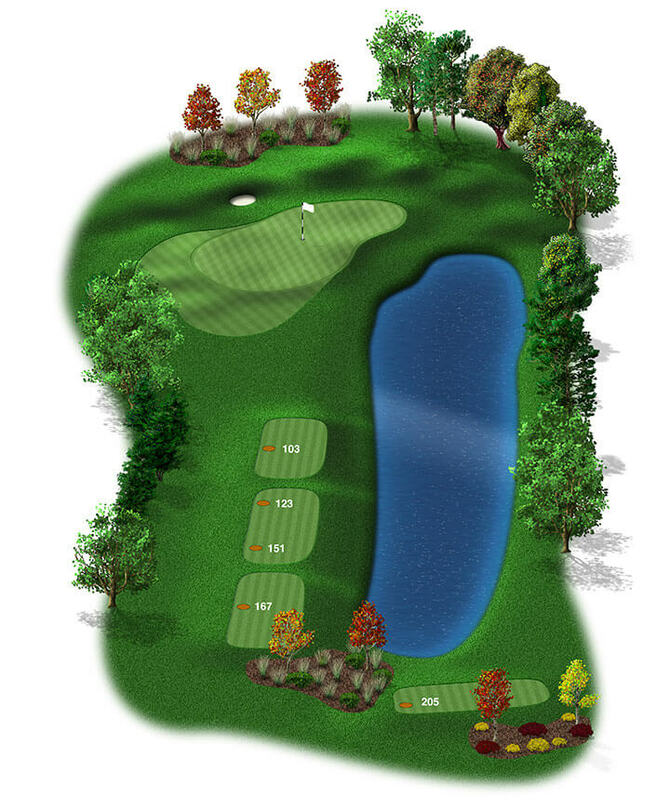 This unique green will force the players to hit their exact distance number off the tee or it can cause an awkward putt. 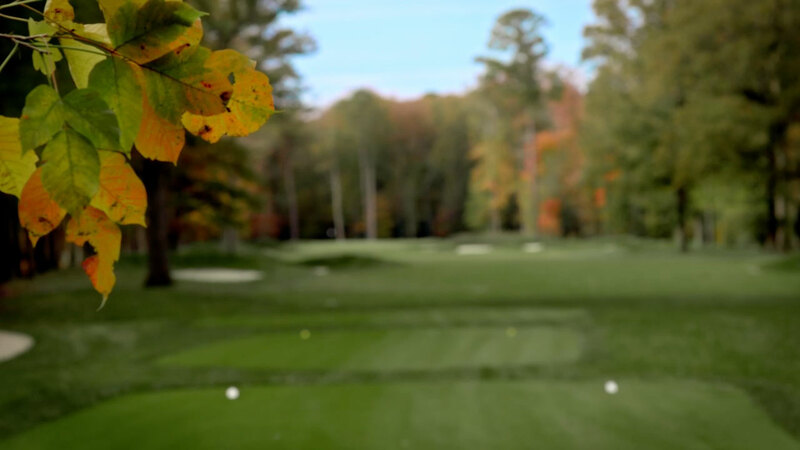 Navigating the two ridges of the green requires perfect touch with the putter and the ability to read greens. What you see is what you get. 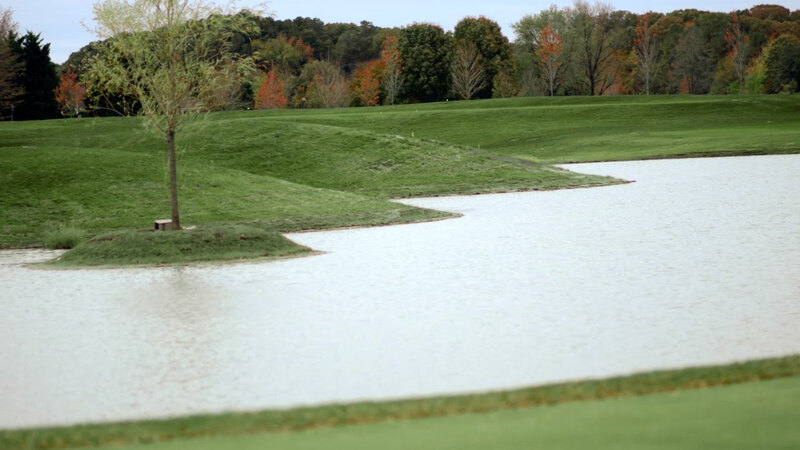 The lake to the right shouldn’t come into play, but you will still face a long shot to a green. 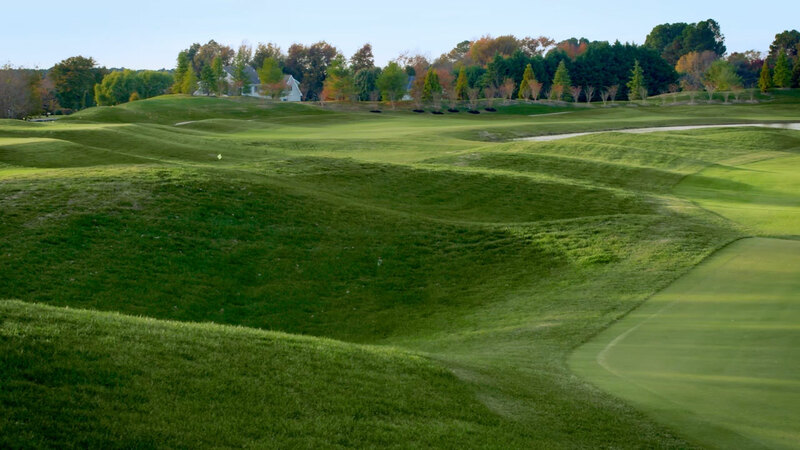 The fairway slants slightly to the left and if you are not careful will funnel down to a collection area behind large mounds. This will totally block your view of the green. 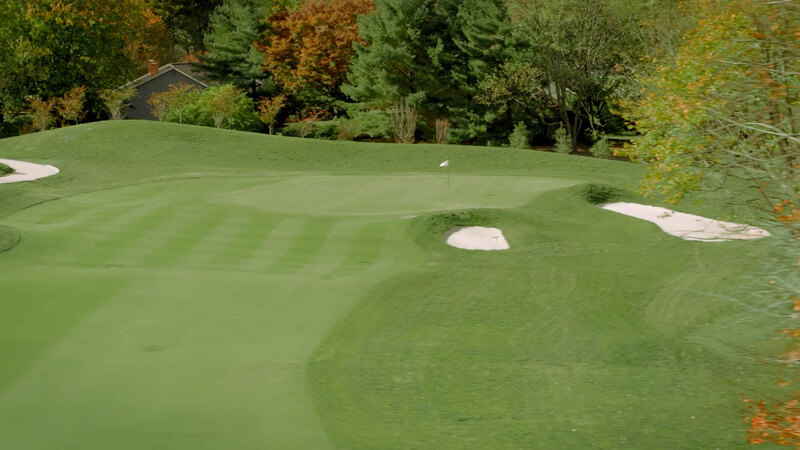 There are only two pot bunkers to the right of the green. If you miss the green there is no severe penalty and should be an easy up and down. The green is small and fairly at and should be receptive to good putting. There are many ways to tackle this deceptively short hole. 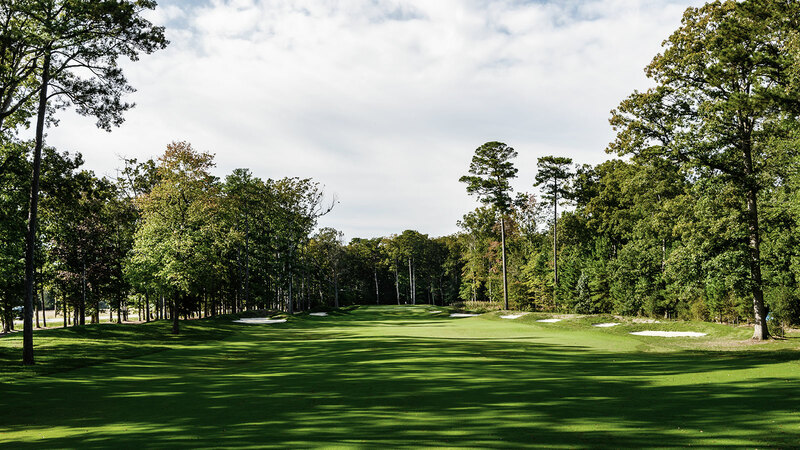 The wisest is to lay up into the center of the fairway between the bunkers followed by an accurate wedge shot to the green. 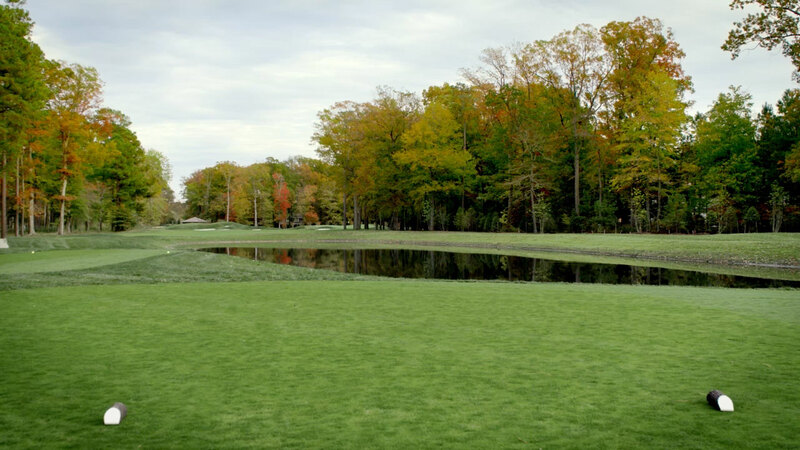 The small pond located o the tee will not come into play unless a shot has been miss hit. But long hitters will be very tempted to go for it all with one big blow. 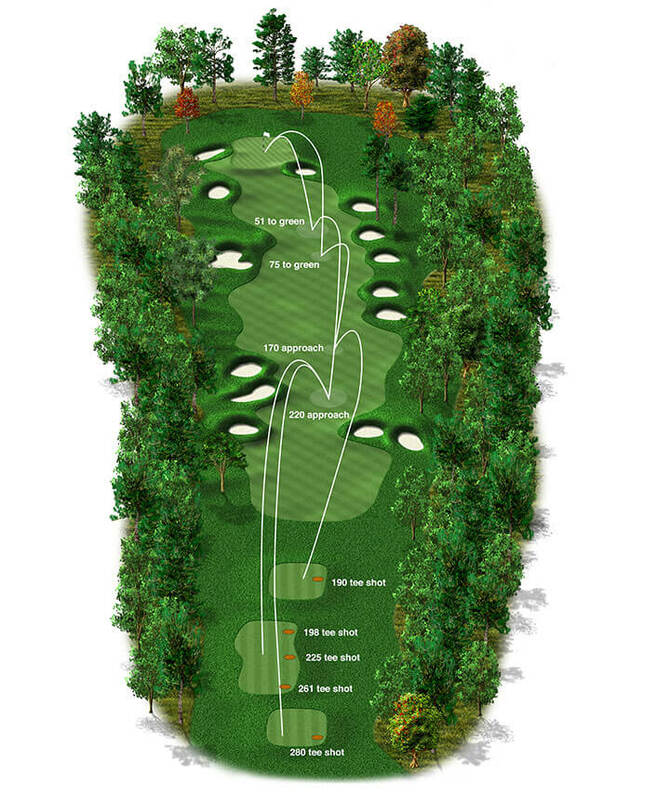 This is a great risk reward hole. There is all kinds of trouble surrounding this small green which is slightly elevated. Bunkers and mounds are the least of your problems if you short side yourself. 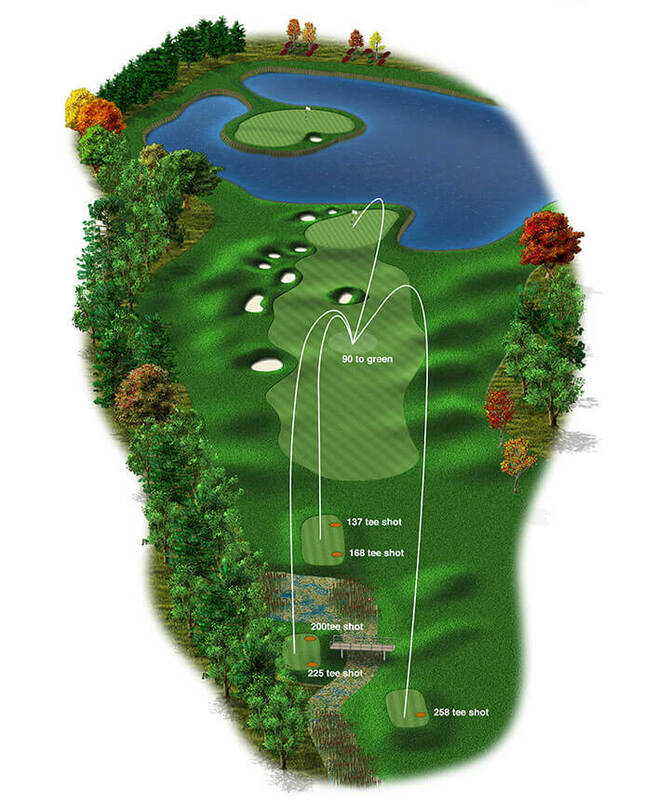 The hole should yield many birdies and a lot of doubles and higher. 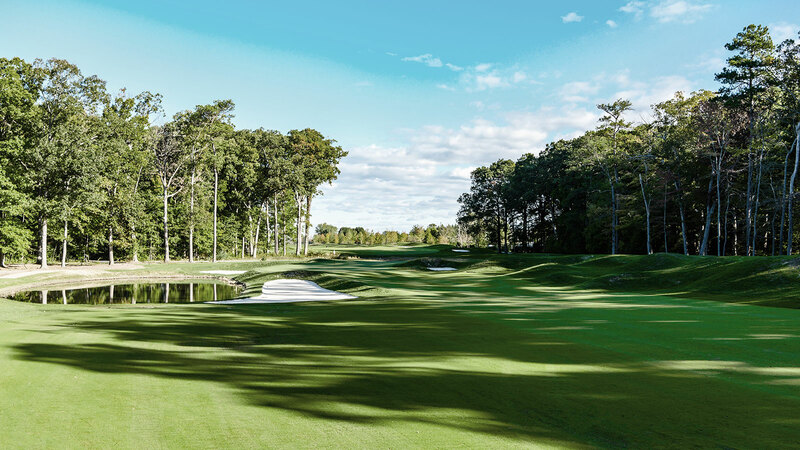 Starting at the point furthest from the clubhouse, this hole presents a great opportunity to kick o the back nine with a bang. 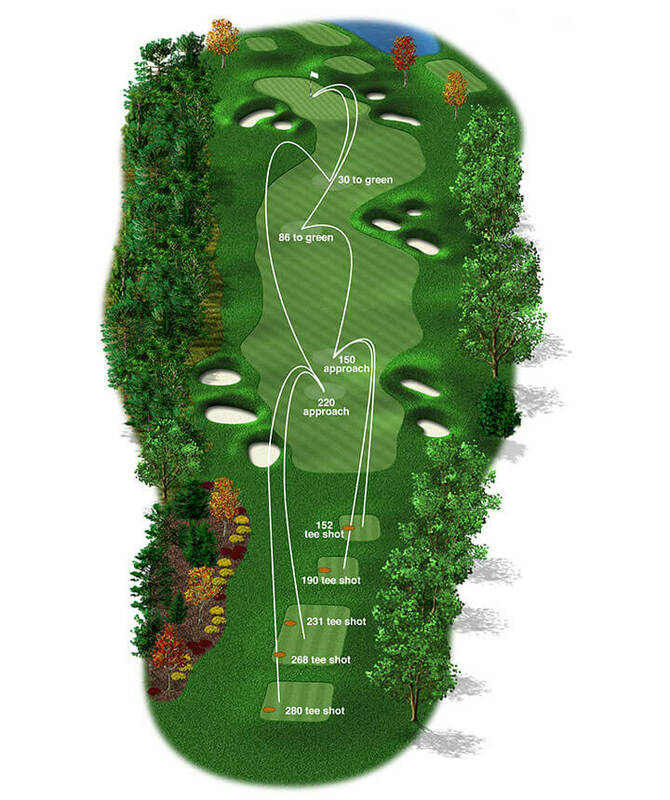 This is the rest of three par 5’s to be played in the next five holes. 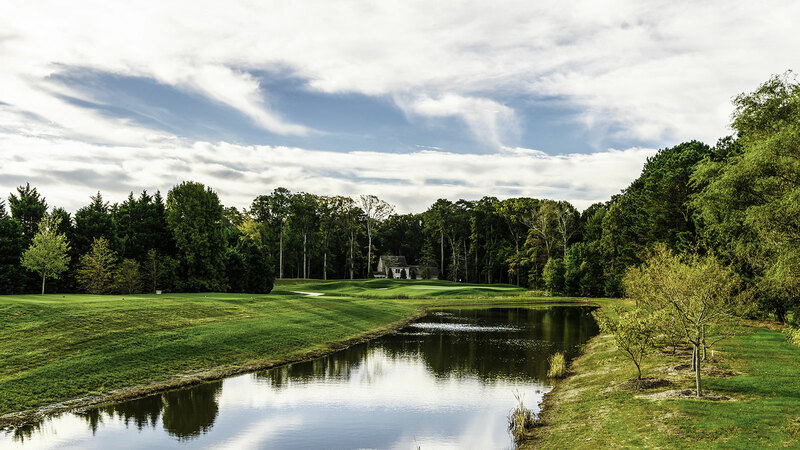 A very well placed water hazard will force you to keep your tee shot down the right side into a narrow landing area. 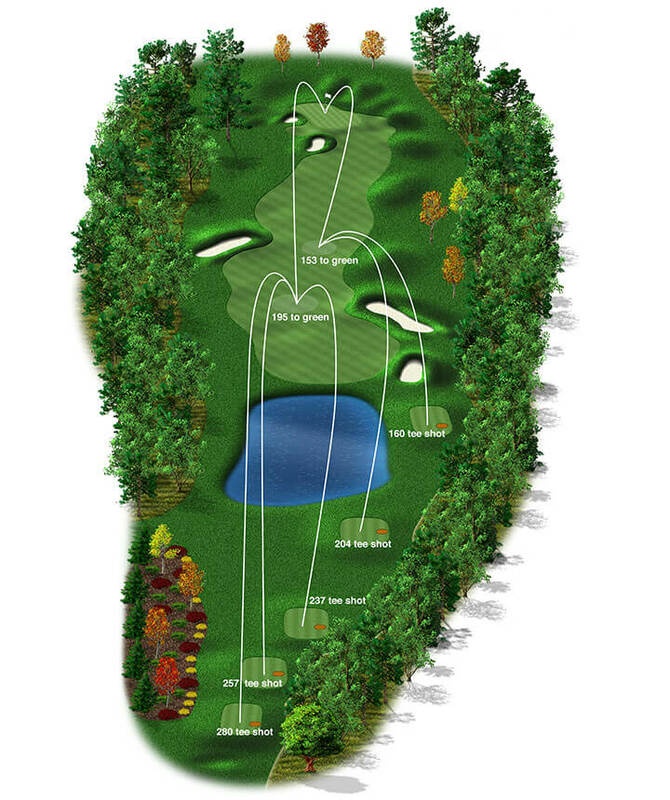 The second shot becomes easier as the fairway become wider. 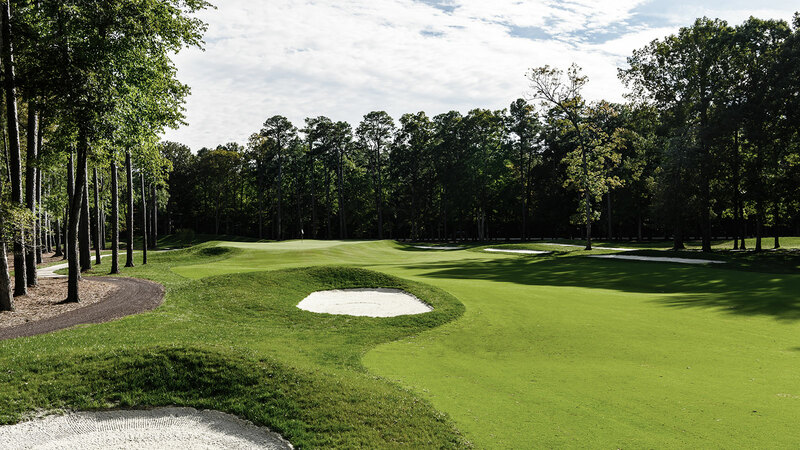 There are only a couple bunkers that you must pay attention to which will mostly collect errant shots. 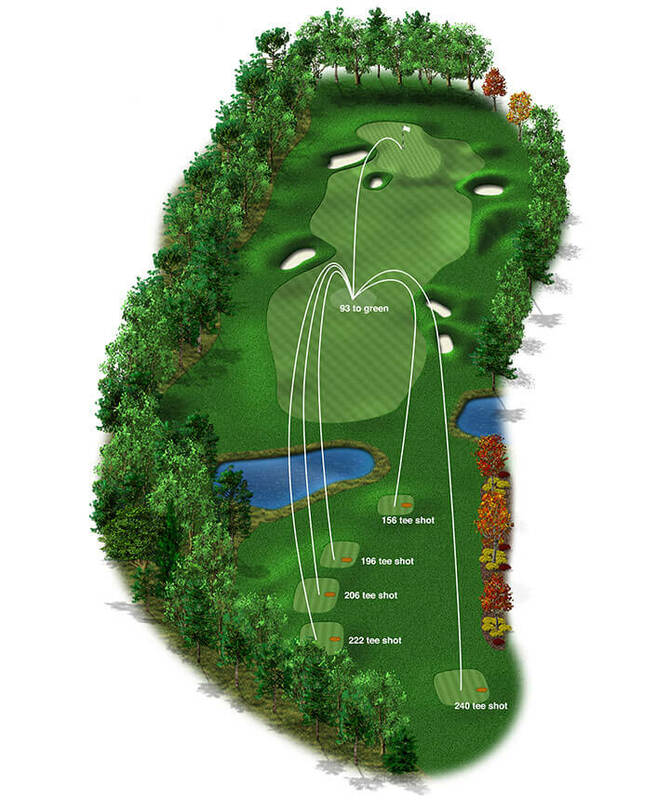 Three solid, placed shots will get you to the slightly elevated green. The approach wraps around the front and right sides of the green. 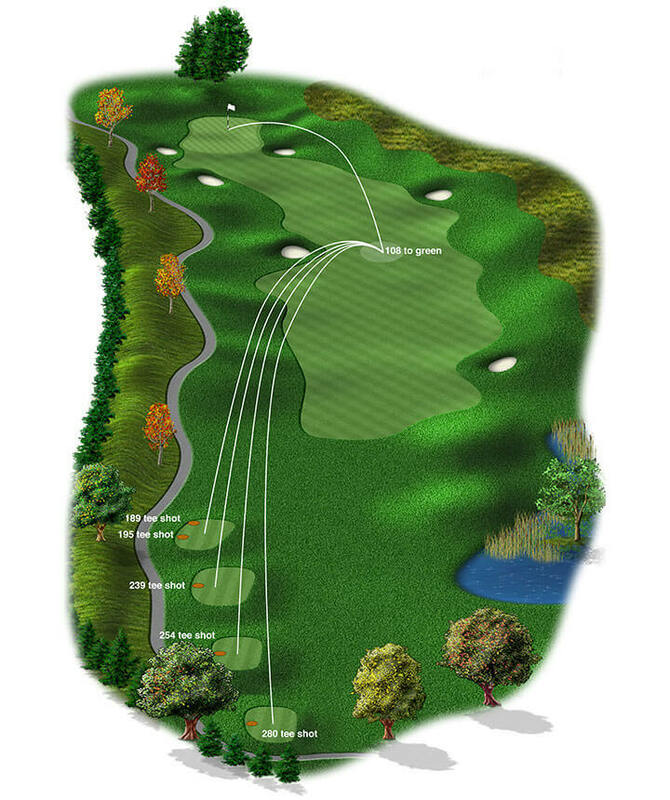 Be careful to hit enough club to reach the green or the ball will roll back down onto the fairway. This hole requires you to hit an accurate golf shot. 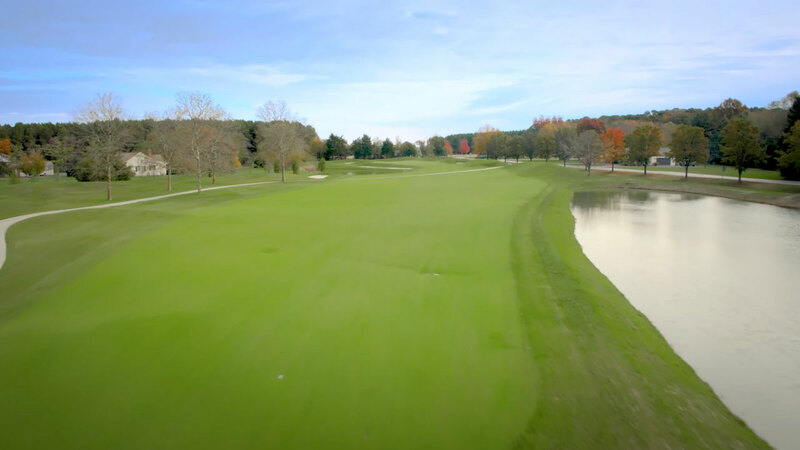 The long, narrow green (165 feet long) will challenge golfers of all levels. The right side is open and allows the best chance for an up-and-down. 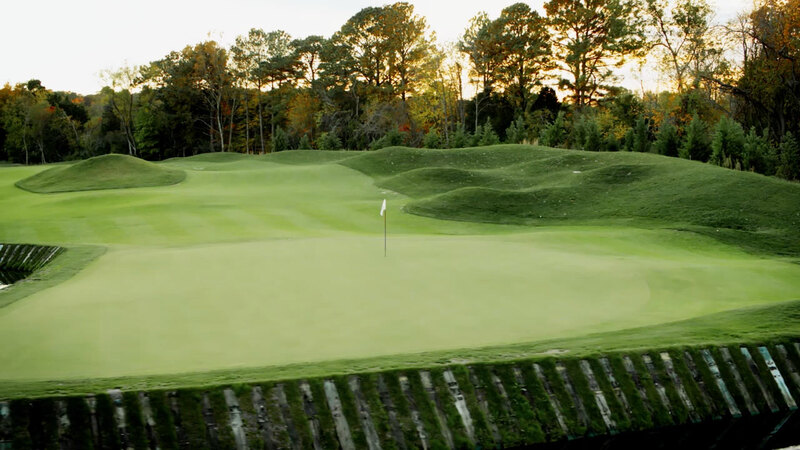 The left side is protected by strategically placed pot bunkers. 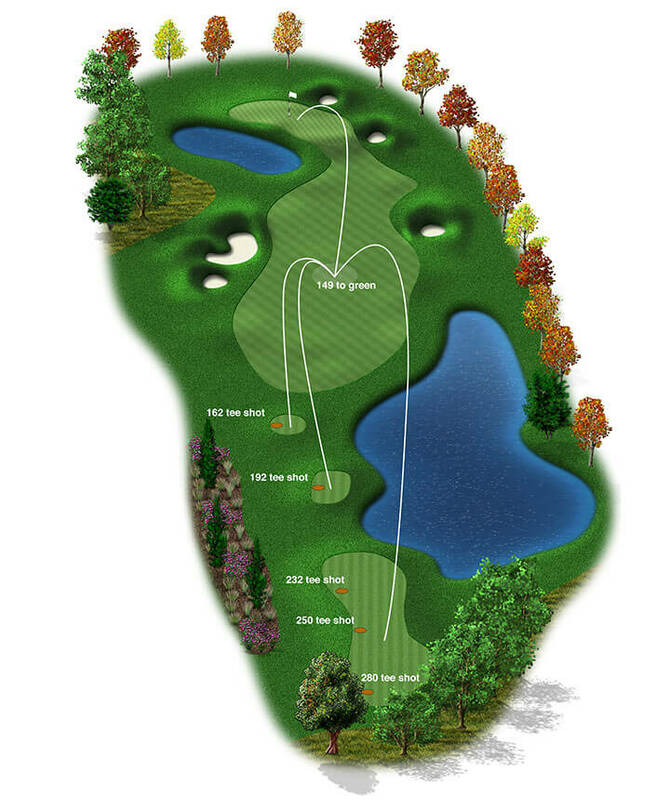 Distance control will be a factor to get the ball close to the hole on this long green. 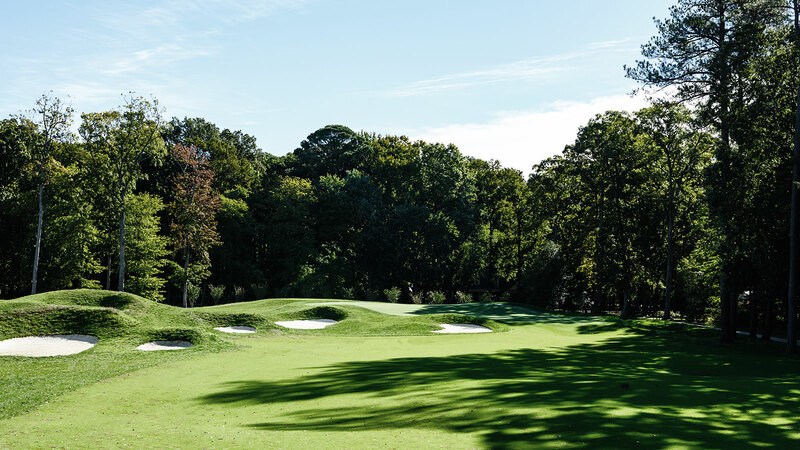 #12 is the longest hole on the course with the largest number of bunkers, 14. 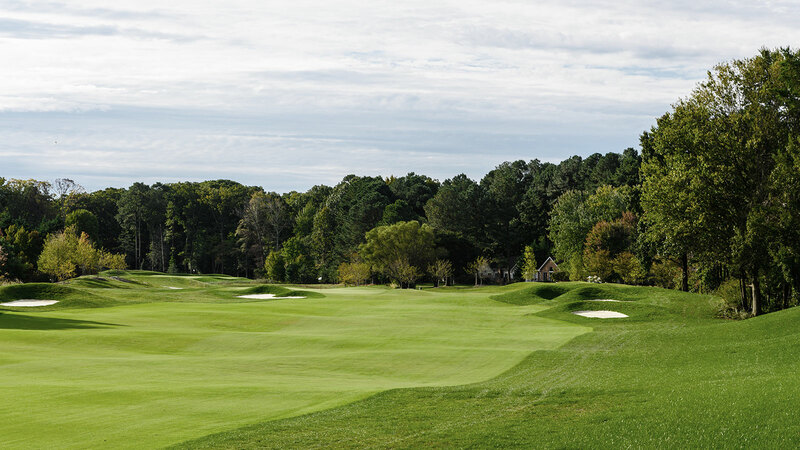 With the large number of bunkers and narrow landing area there is a premium on driving the ball in the fairway. The wood line on both sides of the fairway make this hole look tighter than it really is going to play. 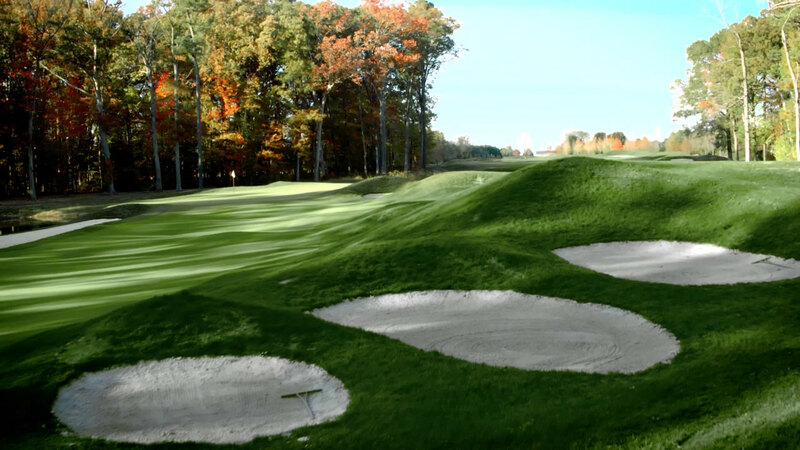 The typical Pete Dye bunkers with high lips will force even the best sand players to pitch out instead of going for the green. The large green is well bunkered with a lot of movement in the putts. 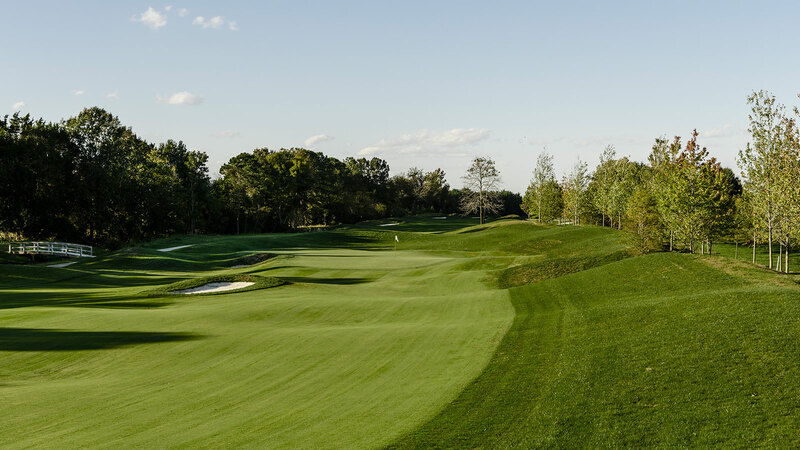 A slight dogleg to the right with a visually stunning bunker complex along the left side of the approach area. 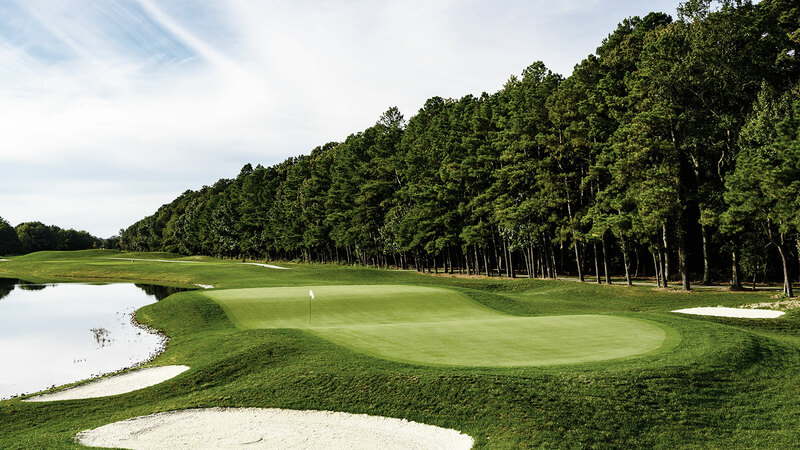 The smart golfer will play from the tee to well short of these bunkers. 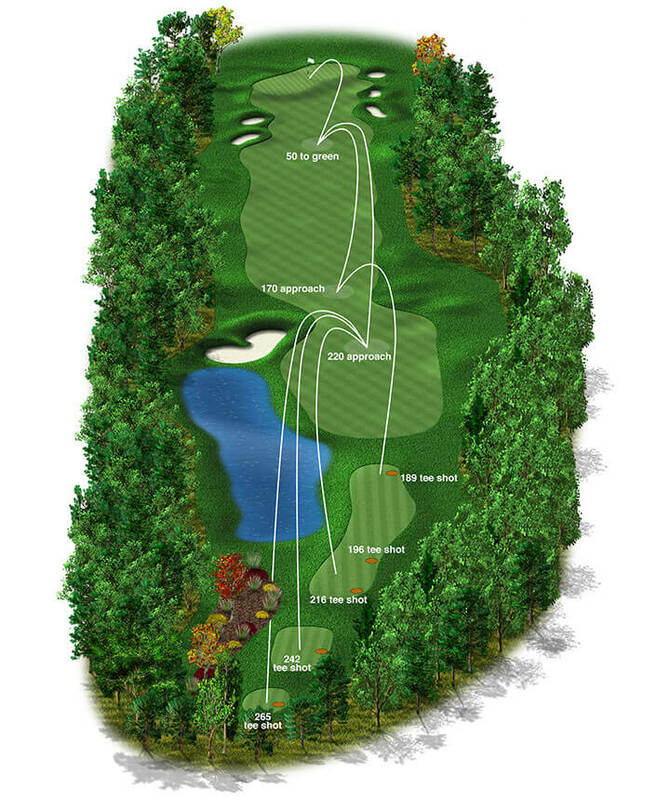 The ideal tee shot is to the left side of the fairway, this will eliminate the trees guarding the right side of the hole. 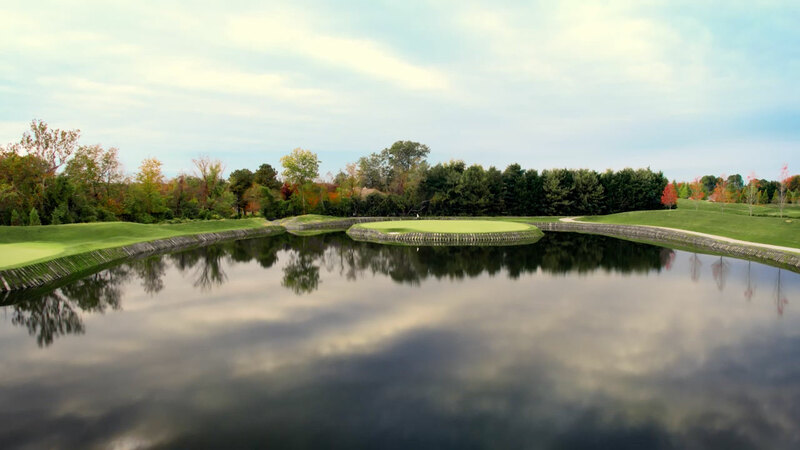 The pond may distract you, but will not be a factor unless you don’t give it any attention and hit a poor shot. 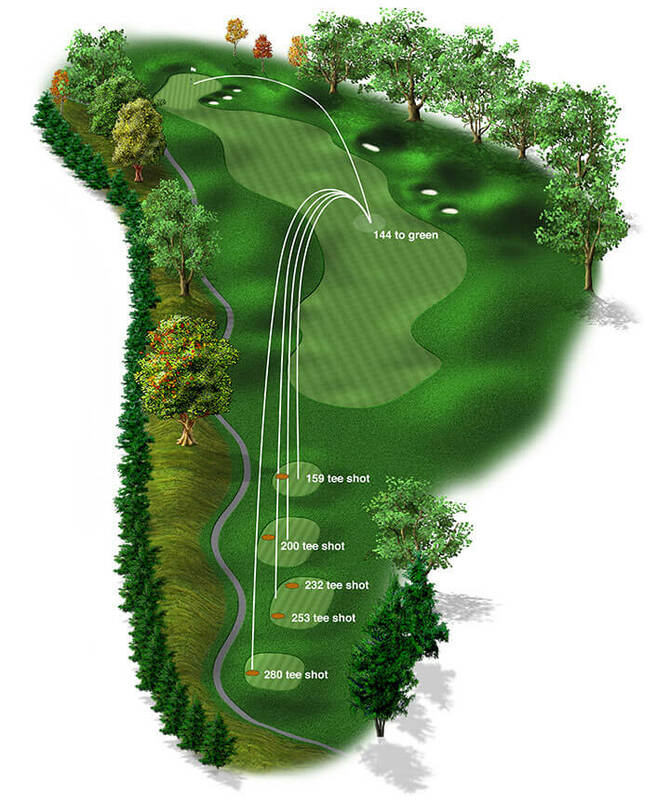 The second shot needs to be on line, being short of the green will not hurt you and will be an easy chip. The green slopes from back to front and this is one time you do not want to be above the hole. From the tee, the landing area looks very narrow but have some trust. 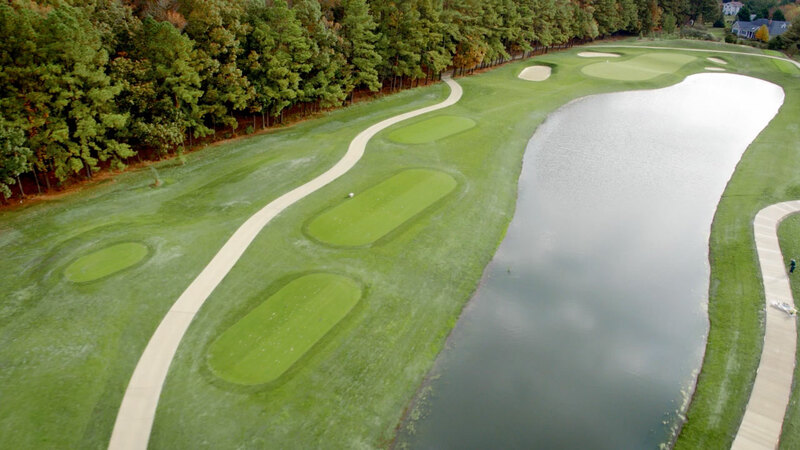 This hole is a dogleg right with a water hazard running down the right side for more than half the length of the hole. 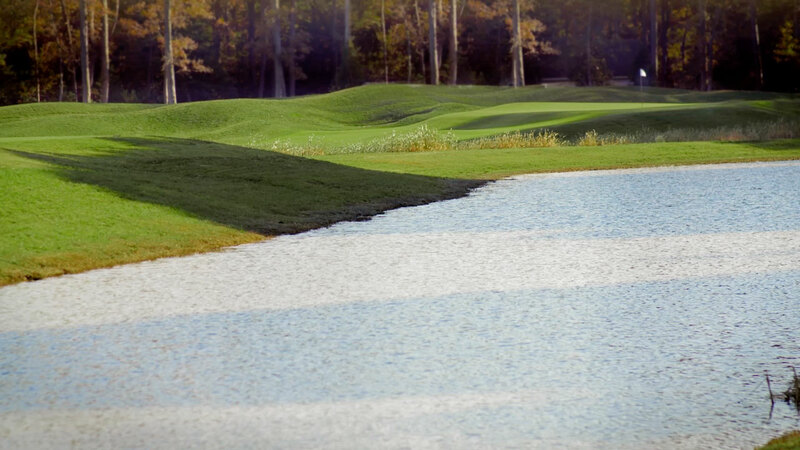 A twelve foot wide sand bunker runs parallel to the water hazard making the water look wider than it actually is. After the tee shot the fairway widens. 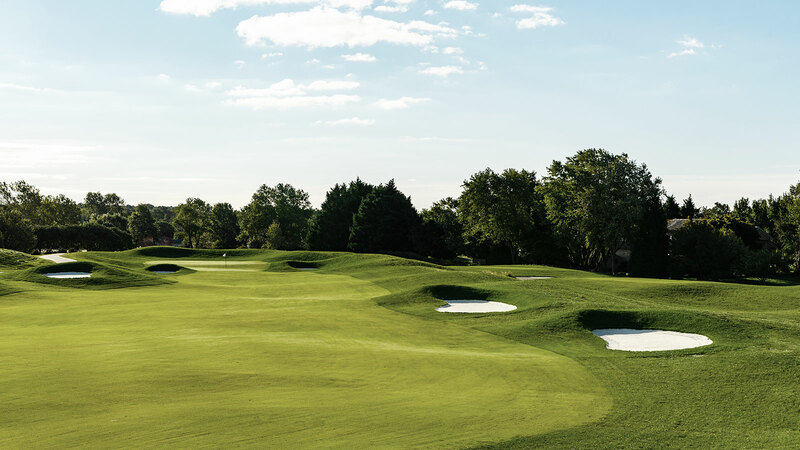 A series of bunkers line the right side short of the green. 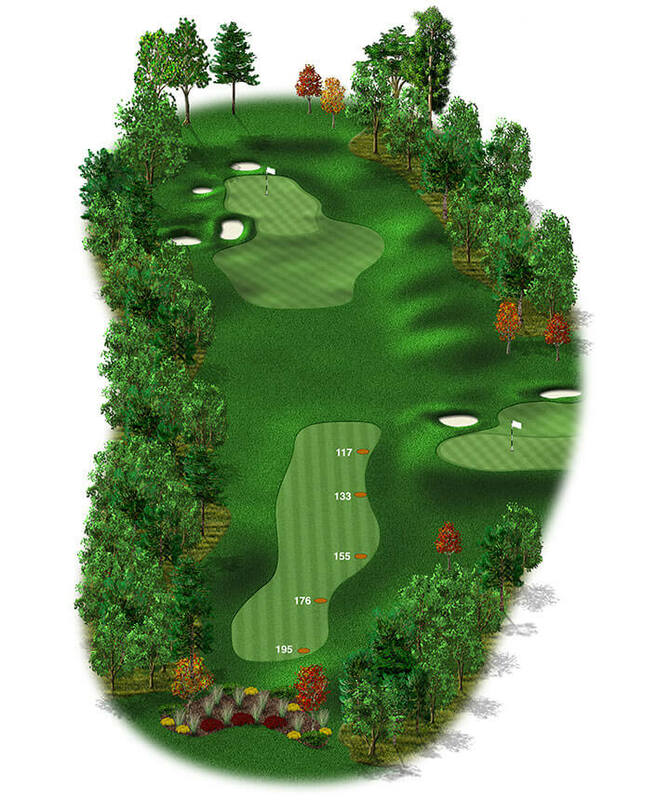 The left to right shaped green is surrounded by a large hazard, numerous pot bunkers, and rolling terrain. 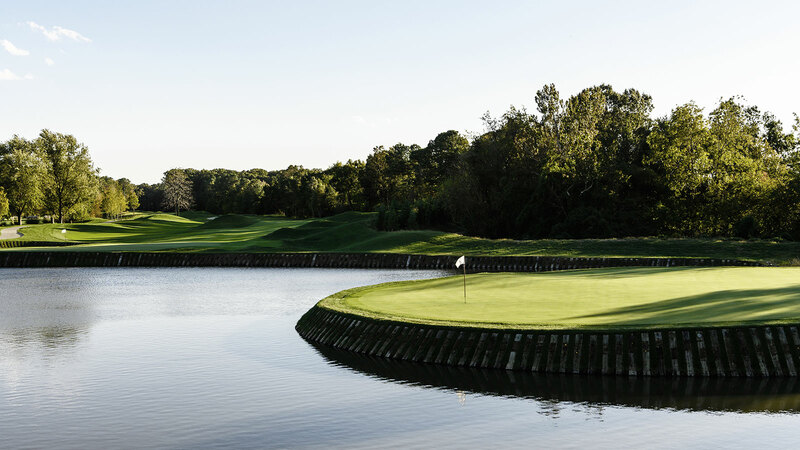 This hole is the longest par 4 on the golf course. From the teeing ground you cannot see the green. 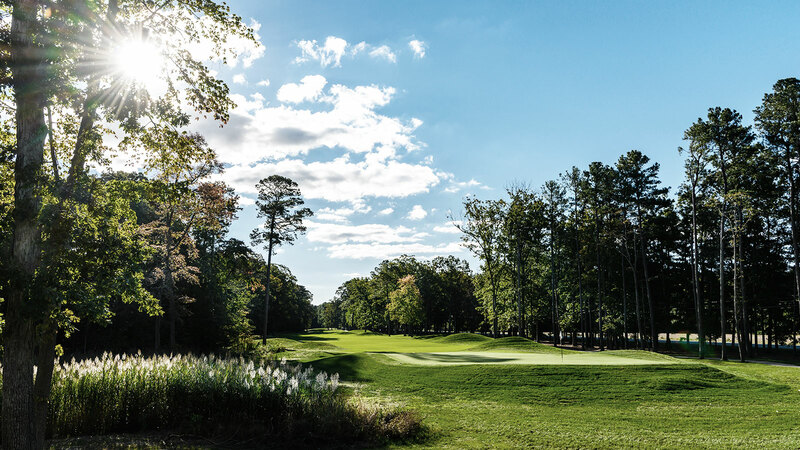 The fairway is widest of any hole on the property. 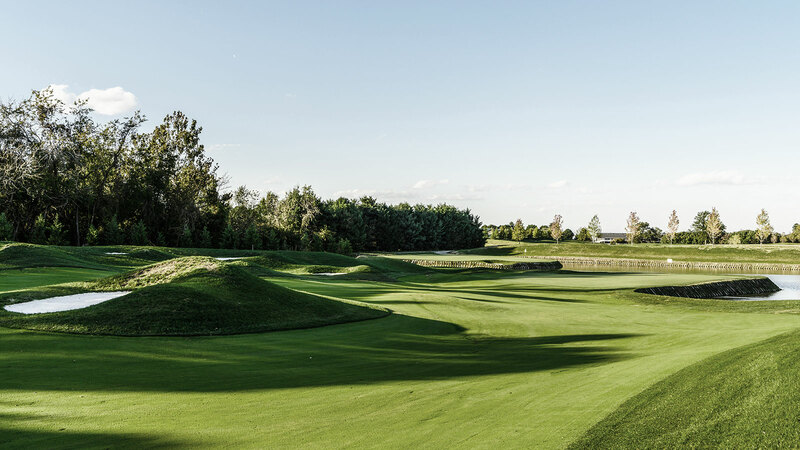 At 475 yards from the tips tee, this hole will test the best of golfers. 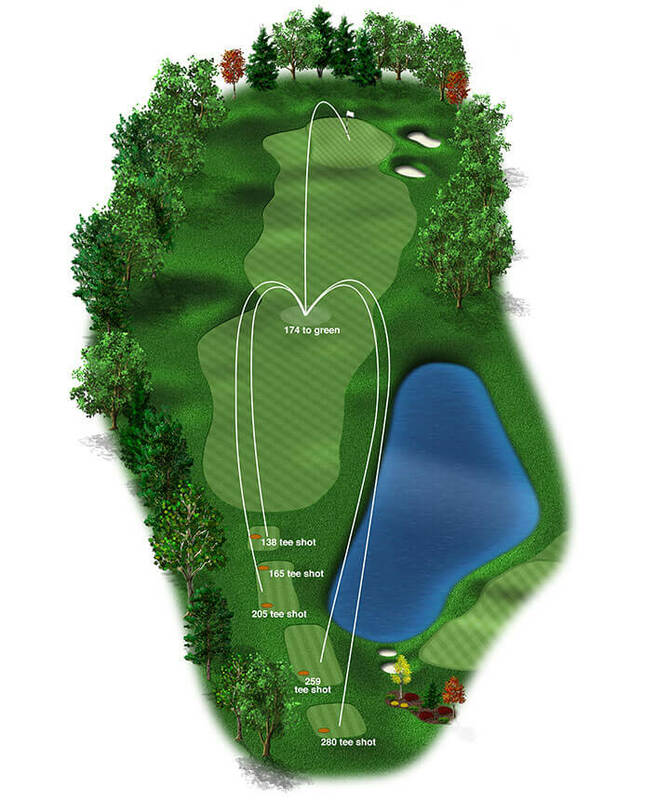 The tee shot is slightly up hill and should favor the right side of the fairway. There is not much trouble o the tee. 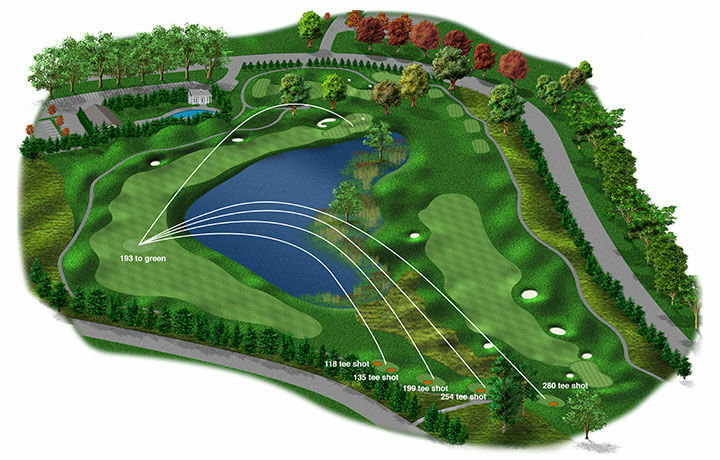 The approach shot is a little downhill and the small green is protected by mounds and bunkers. 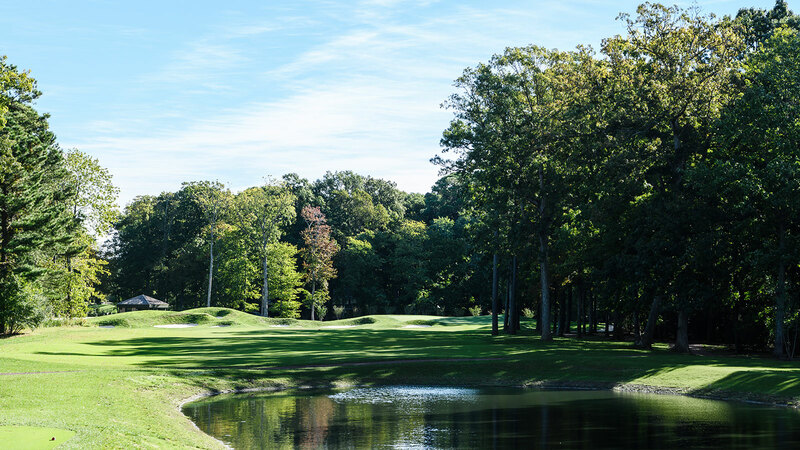 There is a little room right of the green for a bail-out, but getting a par on this hole will require your best efforts. 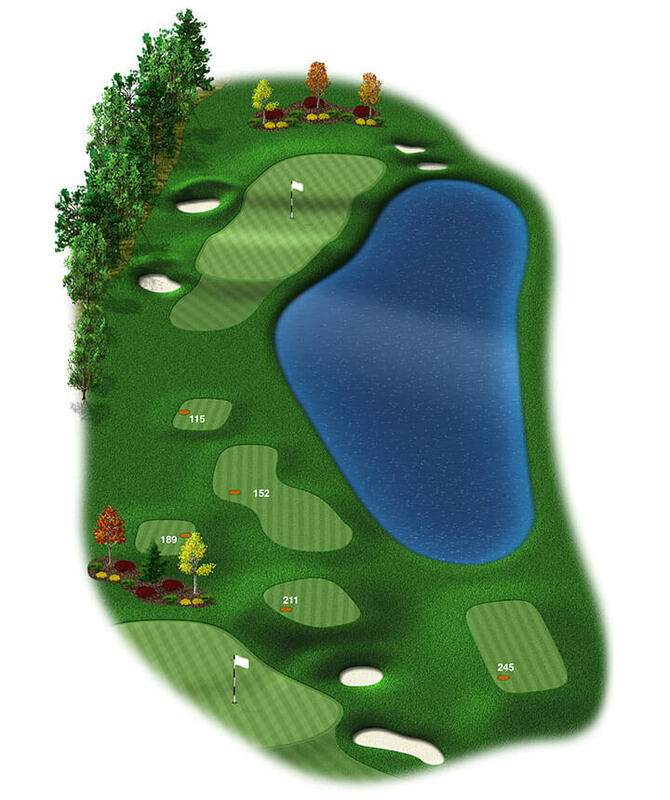 The green is smaller then most and the subtle humps will make you have to concentrate on every stroke. The beginning of Pete’s “goodnight kiss,” off the tee this does not look like much of a challenge. 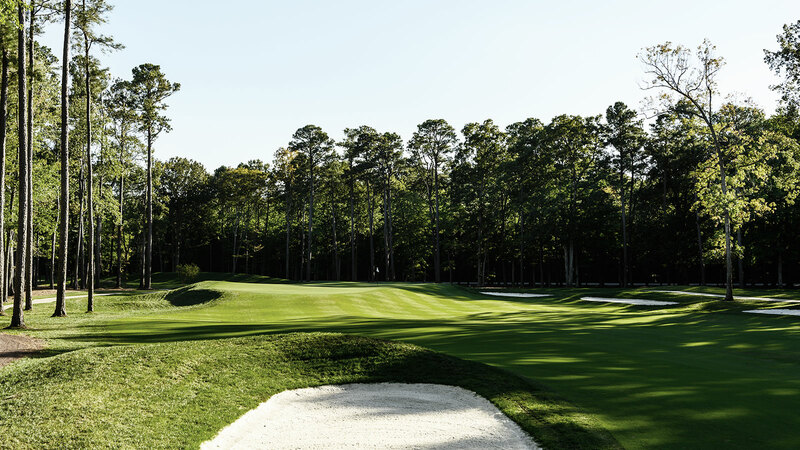 The fairway is wide and only a few bunkers guard the left side of the fairway. There is however a large pot bunker on the middle of the fairway near to the landing area. This forces a player to choose the high or low side. 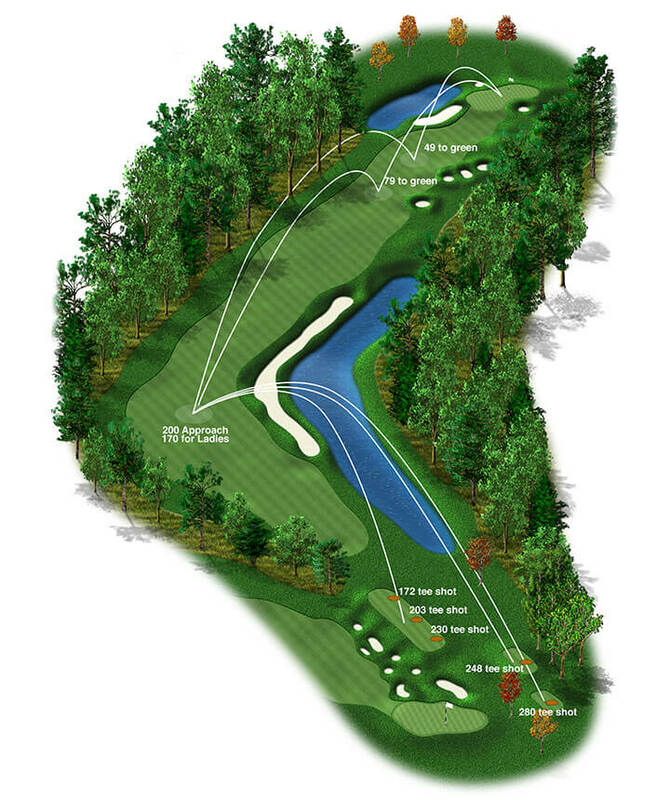 If you choose the high side you take the water out of play on your second shot. There’s water behind the green and to the right, as well as pot bunkers on the left. 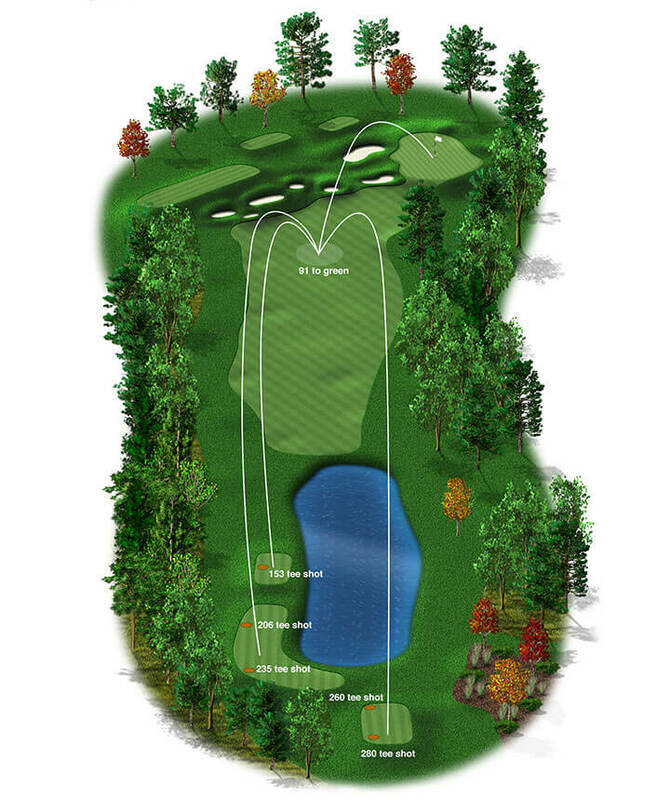 Which means the key here is hitting a tee shot that leaves you with a comfortable distance for your approach. 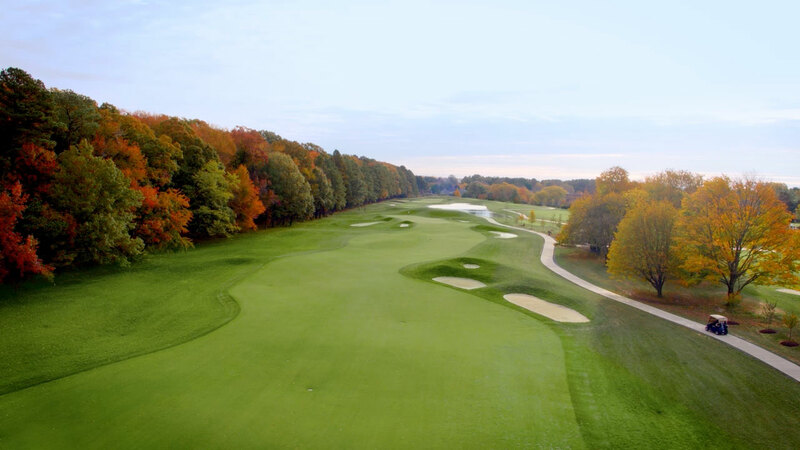 A “Dye-abolical” hole that only the Dye family could build, this could be the course’s toughest test if the wind is blowing! The island green is supported be an angled series of railroad ties. It’s the ultimate chance to be a hero. 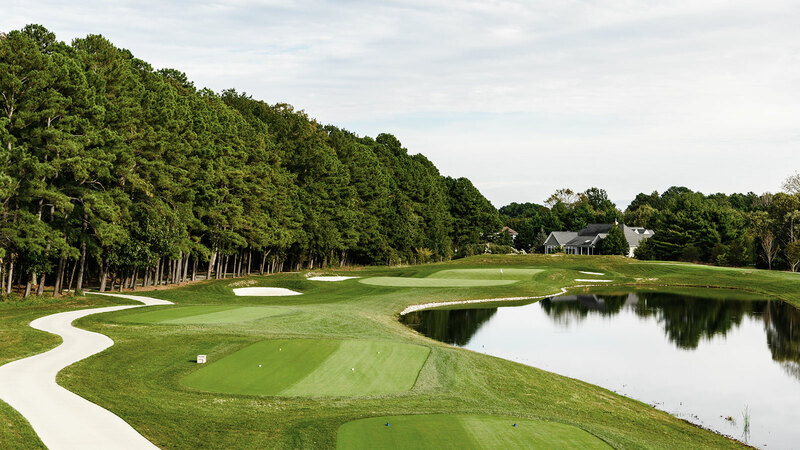 Chesapeake Bay, which is visible from several spots on the hole including the green. This is the scariest tee shot of the day. Although the lake is intimidating, you still must trust your swing and take on as much of the water as you feel comfortable. There is bail-out space to the left but that will increase the difficulty of the hole and make the second stroke harder. Regardless of your position you will have to concentrate to hit your best shot of the day. 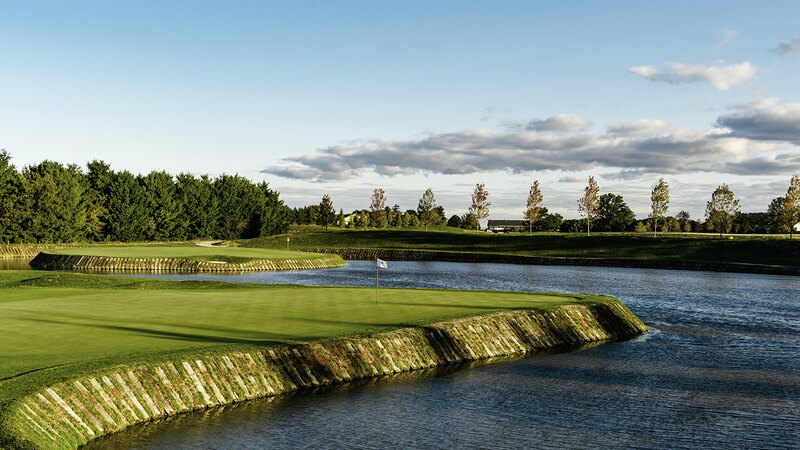 With water still lurking green side on the right, and deep pot bunkers on the left, the shot must be hit with precision to the correct level of the green. Make sure you take enough club. 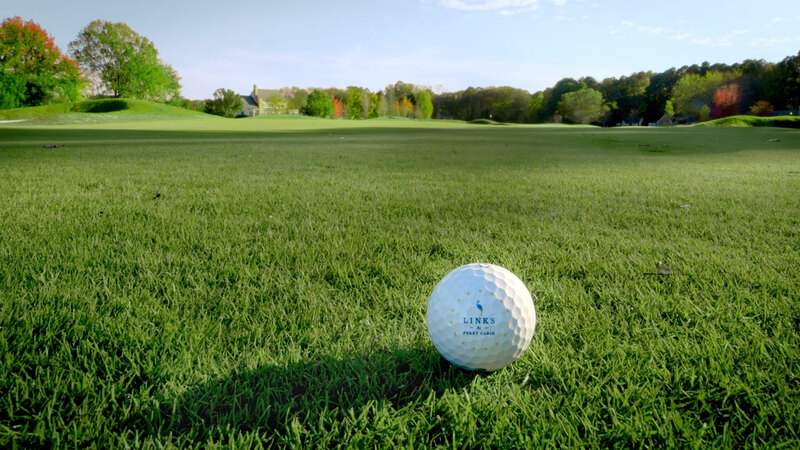 There are three distinct levels and most likely your ball will have to be on the same level as the flagstick to par the last.